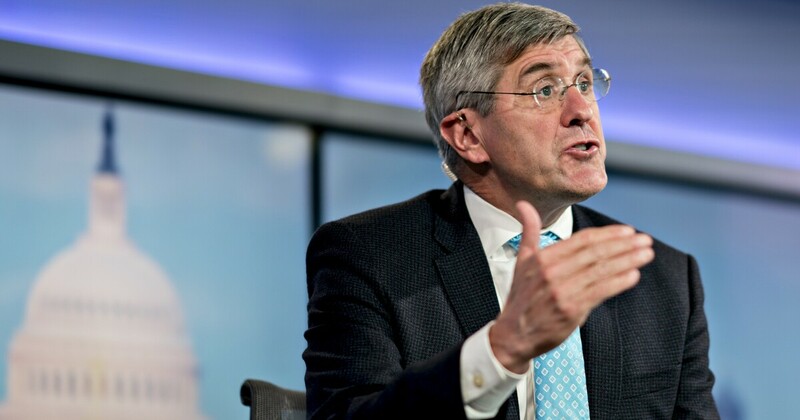 F rom the moment Heritage Foundation economist Stephen Moore's imminent appointment to the Federal Reserve Board was announced by President Trump, Washington has been in full pearl-clutching mode . This week, the anti-trump media found what they think is the smoking gun that will bring him down: a $ 75,000 tax loan. The only problem is that it's the IRS that's wrong, not Steve Moore. First reported on Twitter by Heather Long of the Washington Post, Moore has an IRS taxin filed against him totaling just over $ 75,000. The problem stems from a mistake Moore made on his taxes several years ago. Under the law at the time, a taxpayer was allowed to deduct alimony paid to an ex-spouse but was not allowed to claim child support payments. Moore deducted both, which is the type of honest mistake you see and lot at tax time. The IRS disallowed both the legitimate alimony deduction and the illegitimate deduction for child support. The $ 75,000 represents back taxes, penalties, and interest for the disallowance of both deductions. As reported by Katy O’Donnell or Politico Moore does not dispute the back taxes, penalties, and interest for the child support deduction. But is (unwillingly) unwilling to pay back taxes, penalties, and interest for his completely allowable alimony deduction. In fact, he has intentionally overpaid the IRS in the following years: "The IRS owes us money; we don't owe them money – we had a $ 50,000 overpayment on our taxes," he said, dubbing the experience "like the audit from hell." If all this is true, it's the IRS who is in the wrong here, not Moore. The long-term supply-side economist made a mistake on his taxes. Let him who is without his first stone when it comes to tax return errors. The IRS is asserted that it wants to not only have its tax deduction for child support, but also its legitimate deduction for alimony payments. It gets worse. The IRS is sending correspondence about the old mailing address, one it never updated despite the subsequent tax filings from Moore. He never saw the multiple IRS letters because he didn't live at that address anymore. It's like a plot thread from the 1980s movie "Brazil." As an IRS enrolled agent who has prepared taxes for nearly two decades, I'm familiar with this type of story. A taxpayer makes an honest mistake, the IRS computers start spitting out letters to which there is no reasonable appeal to a human being at the agency, and things spin out of control. This nightmare of a faceless bureaucracy churning later on, leading to tax and levies, is a good argument against increasing the budget for the IRS. Until it can be straightened up its act when it comes to correspondence audits, which this probably started out as, it has no business hiring more tax agents to snoop into our returns. As for the tax media, it would be a good idea to be critical of an IRS that is clearly screwed up here as they are of Moore, who is caught in a Kafkaesque trap or bureaucratic incompetence. But he has a Trump app, so the rules of fairness probably don't apply anyway. Ryan Ellis ( @RyanLEllis ) is president of the Center for a Free Economy.